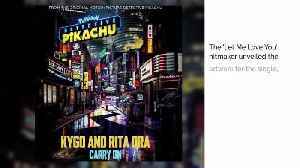 Rita Ora has recorded the track 'Carry On' with tropical house DJ Kygo for the forthcoming 'Detective Pikachu' movie soundtrack. Rita Ora was taught Spanish by her taxi driver when she brought him into the studio to help with 'R.I.P. ', her collaboration with Sofia Reyes. As long as she brushes them.